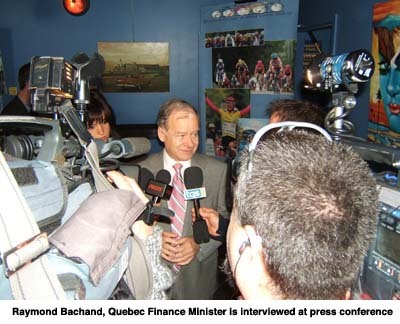 Today the TV cameras were on Daniel Manibal and his guest of honour, Quebec Finance Minister Raymond Bachand. 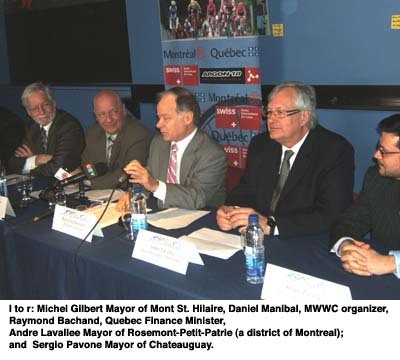 Manibal is organizing his twelfth annual Montreal Women's World Cup (MWWC) race and the eighth annual Tour du Grand Montreal (TdGM), and he is doing this in difficult economic times, underlying the importance of having the number two man in the Quebec provincial government sitting beside Manibal at the conference table. The two UCI-sanctioned events will follow the same format as in 2008. Joining Manibal and Bachand at the conference table were the four mayors of municipalities hosting various stages of the TdGM; Richard Goulet of Granby, Michel Gilbert of Mont St. Hilaire, Andre Lavallee of Rosemont-Petit-Patrie (a district of Montreal); and Sergio Pavone of Chateauguay. Manibal spoke first and last among the six men, beginning with allusions to how Montrealers want "the [Stanley] Cup" to come back to Montreal, but the Women's World Cup road race will definitely be here for May 31st. He also emphasized how Bachand is a very busy man and how lucky the cycling world was to have him there. Pavone spoke second, mentioning how his city will continue to spend on the first stage of the TdGM despite facing massive budget cuts due to falling revenues (he later told CC the town will spend some $35,000 on the TdGM, while trimming $1.2 million elsewhere). The Chateauguay Mayor also spoke about how the race attracts people to his town, inspires youth and underlines feminine beauty. The other mayors gave generally similar messages. Lavallee - who is also in charge of urban planning and transportation for Montreal - pointed out that Montreal is the only city in North America to host UCI-sanctioned road races. Bachand joked about how he rides a bike but is not quite of the same caliber as the female cyclists who storm up the road to the top of Mount Royal during the MWWC. He congratulated those Quebec women who have competed in the event, including Julie Marceau, Karol-Ann Canuel, and Lyne Bessette, describing these athletes as an inspiration "for all the girls of Quebec". Manibal took the microphone a second time and uttered a long list of federal, provincial, and municipal sponsors who are all "very important" for the continuation of the two events. He also thanked the various private and media partners of the events, speaking briefly in English. The six men later posed for photos with Canuel and Marceau (both Specialized riders) beside an Argon18 bicycle. A cold buffet followed the press conference, prominently featuring Swiss cheeses. Cheeses from Switzerland is a new sponsor of the events. The 2009 Montreal Women's World Cup will take place May 31st as a 111 kilometre road race of 11 laps of a 10.06 kilometre circuit around and over Montreal's 233 metre Mont Royal. The 2008 event was won by German Judith Arndt (Team High Road) in a time of 3:11:34, followed by Italian Fabiana Luperini (Menikini-Selle Italia) and Canadian Leigh Hobson (Canadian National Team). The five stage Tour du Grand Montreal takes place from June 1-4. Chateauguay will see a 85 kilometre road race on June 1st, followed by a 104 kilometre road race in Granby on June 2nd. June 3rd will see a 3.5 kilometre ITT in Lachine in the morning and then a 50 kilometre crit in Little Italy that evening. The final 115 kilometre stage takes place on June 4th amid Mont St Hilaire's apple orchards.